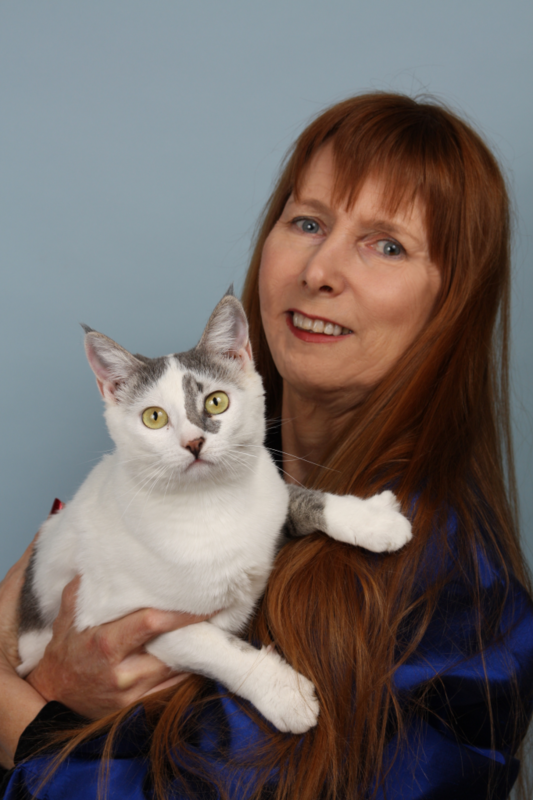 This Goodnewsforpets interview features Dusty Rainbolt, the immediate past president of the Cat Writers’ Association (CWA). Goodnewsforpets.com publisher Lea-Ann Germinder has known fellow Texan Dusty Rainbolt since CWA first partnered with Goodnewsforpets.com in 2000. A few years later, Germinder launched the KNOW Heartworms campaign for Pfizer Animal Health (now Zoetis), the American Heartworm Society and the American Association of Feline Practitioners, helping introduce the concept of heartworm associated respiratory distress (HARD) syndrome, now a commonly diagnosed disease. As you will read here, Dusty took up the cause then and continues to advocate for veterinarians and cat owners to learn more about the disease. We share a mutual love and admiration for the late Dr. Jim Richards, who as Director of the Cornell Feline Health Center, did all he could to champion better veterinary care for cats. For Dusty, when you combine her solid journalism skills and her love for writing about cats, it’s a purrfect match…. I’m the Accidental Cat Writer. I worked as a reporter for a small local newspaper. None of the senior reporters wanted to cover a new dog deli, so guess-who got the assignment. My editor was so happy with the story she gave me all the pet-related assignments. I covered a variety of pet-related topic in the 1980s and 90s, including: euthanasia at the shelter, the unheard of concept of microchipping dogs and cats, a lost cat and later the recovery of said lost cat. I sent an article and a short story to the now defunct Cats Magazine, which they bought. They later sent me an assignment and another and another. I was hooked. I met Midnight Louie mystery series author, Carole Nelson Douglas at a science fiction convention. After I mentioned my Cats Magazine article, she suggested I join CWA and offered to sponsor me. The first newsletter mentioned a new pet magazine (Pet Life) was looking for writers. I submitted some proposals and got the assignments. One article was about outside dangers and cats. It won the 1996 CWA/ACFA Cat Safety Award, my first award ever. In 1997, I attended my first conference. It was a truly life-changing experience that led to so many wonderful things. The contacts I made at the conferences and the things I’ve learned have been invaluable. As a multiple Muse Medallion recipient, what has the award and the Cat Writers’ Association meant to you and your work? I’ve been blessed to be recognized by CWA on several occasions. I so treasure the Shojai Mentor Award I received in 2012. Two CWA members nominated me for that honor and I feel so humbled. But I also tear up when I see my 2008 Dr. Jim Richards/ Cornell Feline Health Center Veterinary Issues Award. Just days before his tragic fatal motorcycle accident, Jim agreed to be the tech editor for my new book, Cat Wrangling Made Easy. 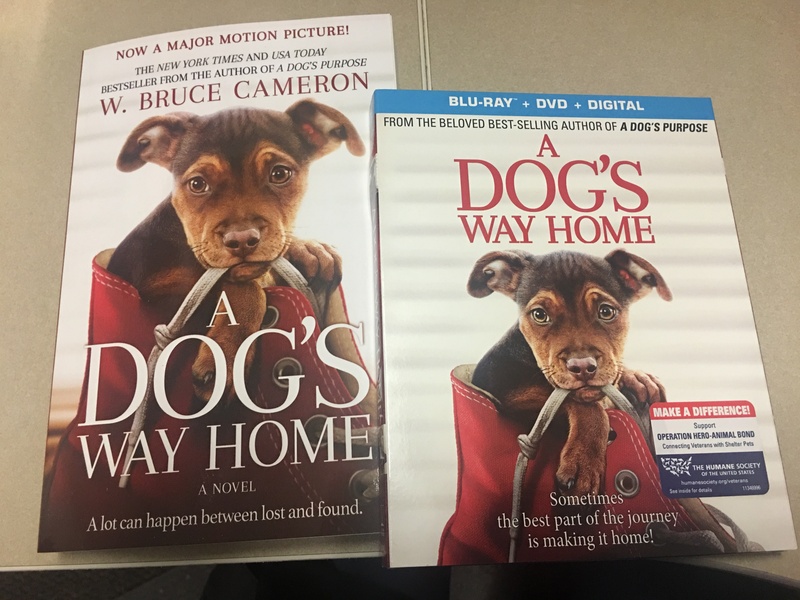 In exchange, he asked me to include Heartworm-Associated Respiratory Disease (HARD) in my book. “But, it’s not a multicat issue,” I protested. “Dusty, it’s important, and nobody’s writing about it.” Reluctantly I agreed. A few days later when I learned about Jim’s passing, I picked up the mantle. For Jim, I would educate as many people as possible about HARD. A few weeks after Jim’s death, my asthmatic cat Harli, simply fell over dead. I realized that her symptoms and sudden death were consistent with HARD. From then on, I was a woman on a mission. I wrote a column about the disease, which won the Jim Richards Award. Every time I look at it I can almost hear Jim tell me how important it was to educate people about feline heartworms. Mosquitoes and heartworm disease have been a prevalent topic of discussion lately. Have you written about heartworm disease and why? Yes as often as I can and I will continue to do so. It’s an issue I am passionate about for very personal reasons. I lost a cat to the disease, but more importantly it was something that Jim Richards felt was important to educate people about and I feel it still is today. 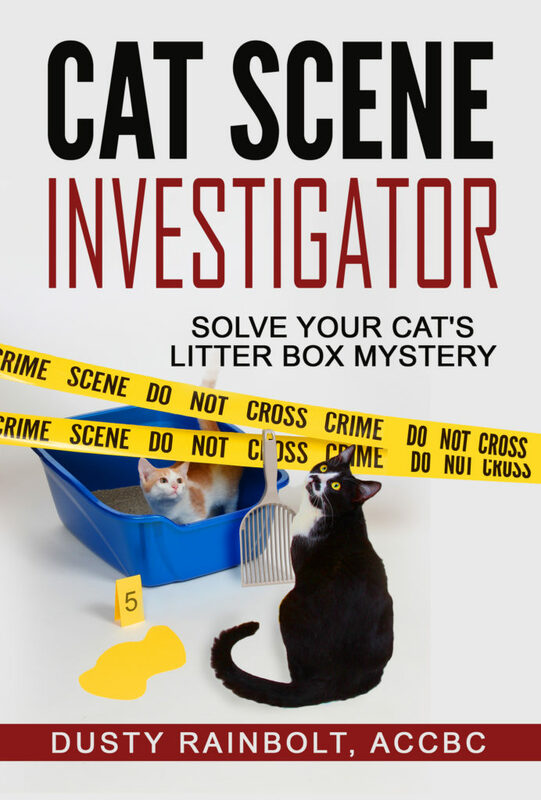 I’m most proud of my new book, Cat Scene Investigator: Solve Your Cat’s Litter Box Mystery. I’ve been rescuing cats and kittens for 30 years. (OMG!) When I get calls from someone wanting to surrender an adult cat, it’s almost always because the cat is peeing outside the box. As a rescuer and writer, my primary goal is to keep the cat in his home. If his or her family can resolve their cat’s problem that leaves foster homes open for truly homeless cats. I hope this book will help keep kitties in their homes. I want to repair that damaged bond between a troubled cat and his family. I want my book to educate. Can you give us a preview of what your new book, “Cat Scene Investigator: Solve Your Kitty’s Litter Box,” is about? Is It Peeing or Marking? Can you tell us a little bit about the process, research and interviews that went into your creation of Cat Scene investigator: Solve Your Kitty’s Litter Box? This book was three years in the making. CSI includes 10 pages of selected sources sited, including interviews with Byron L Blagburn, MS, PhD, : C.A. Tony Buffington, DVM, PhD, DACVN, Ahna Brutlag DVM, MS, DABT, DABVT, Elizabette Cohen, DVM, Nicholas H. Dodman, BVMS, MRCVS, Lorie Huston, DVM, Karen Johnson, DVM, Diane Levitan, VMD, Dip ACVIM, Niwako Ogata, Ph.D., DACVB, Glenn Olah, DVM, DABVP (Feline), PhD., Karen Overall, MA, VMD, PhD, DACVB, CAAB, Arnold Plotnick,, MS, DVM, ACVIM, ABVP. Cynthia Rigoni, DVM and Carlo Siracusa, DVM, PhD, MS. Also interviewed were countless cat owners and behavior experts, Beth Adelman, MS, Marci Koski, PhD, Jennifer Mauger, CPDT-KS, Mieshelle Nagelschneider. When I was unable to personally interview veterinary or behavioral experts, I gleaned information from hundreds of veterinary proceedings and academic papers. From cat writing to paranormal investigation, you explore quite a number of different genres throughout your work. Do you have a favorite genre that you enjoy writing? Hmmm. That’s hard. They’re like my cats. I love them all. I enjoy science fiction/fantasy/paranormal because I get to use my imagination, but I love writing about feline health and behavior because I get to help kitties and their people. Years ago (before I started rescuing or writing), I learned about a kitty who had suffered terrible abuse. I tried to adopt him, but his injuries were too severe, rescuers had put him to sleep. I vowed that I would help cats whenever I could. Shortly after that, someone brought me some two-week-old orphan kittens. It was time to step up and keep my promise. I’d never cared for such fragile creatures. I was like Prissy in Gone with the Wind. I didn’t know nothin’ about caring for babies! Every day I try to grow as a pet owner and kitty foster parent. Throughout an animal’s life you have challenges: illnesses, behavior issues and difficulties associated with aging. When you foster cats and kittens, they often come to you with physical or emotional baggage. I think I’ve been wordy enough. Learn more about the Cat Writers Association here. Connect with the CWA on Facebook and Twitter. Learn more about Dusty Rainbolt here. Connect with Dusty Rainbolt on Facebook and Twitter.